Everyone is equal before the law regardless of who they love, Irish premier Leo Varadkar has said. Irish premier Leo Varadkar has said that he is not judged by his sexual orientation but by his political actions. 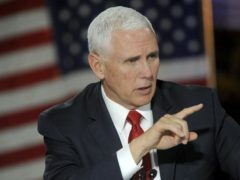 Vice President Mike Pence has accused Britain, France and Germany of trying to “break” US sanctions against Iran. Actress Ellen Page delivered a passionate speech condemning politicians who “hate people” as she accused the US vice president of being homophobic. A US senator has said she turned down Donald Trump’s request to run as his vice president in 2016 because of family concerns. With a new administration imminently taking over in Washington DC, a lot of questions are being asked: what will their approach to immigration be? How will Donald Trump and Mike Pence handle the economy and race relations? And of course: what pets will be joining POTUS and the VP as they move into their new homes?